Ruhollah Khomeini becomes the first Supreme Leader of Iran. Sayyid Ruhollah M?savi Khomeini 24 September 1902 – 3 June 1989, known in the Western world as Ayatollah Khomeini, was an Iranian politician and marja. He was the founder of the Islamic republic of Iran and the leader of the 1979 Iranian Revolution that saw the overthrow of the last Shah of Iran, Mohammad Reza Pahlavi, and the end of 2,500 years of Persian monarchy. Following the revolution, Khomeini became the country’s Supreme Leader, a position created in the constitution of the Islamic Republic as the highest-ranking political and religious authority of the nation, which he held until his death. He was succeeded by Ali Khamenei on 4 June 1989. Khomeini was born in 1902 in Khomeyn, in what is now Iran’s Markazi Province. His father was murdered in 1903 when Khomeini was six months old. He began studying the Quran and the Persian language from a young age and was assisted in his religious studies by his relatives, including his mother’s cousin and older brother. Khomeini was a marja in Twelver Shia Islam, a Mujtahid or faqih and author of more than 40 books, but he is primarily known for his political activities. He spent more than 15 years in exile for his opposition to the last Shah. In his writings and preachings he expanded the theory of welayat-el faqih, the “Guardianship of the Islamic Jurist”, to include theocratic political rule by Islamic jurists. This principle was appended to the new Iranian constitution after being put to a referendum. According to The New York Times, Khomeini called democracy the equivalent of prostitution. Whether Khomeini’s ideas are compatible with democracy and whether he intended the Islamic Republic to be democratic is disputed. 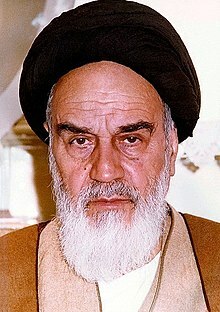 He was Time magazine’s Man of the Year in 1979 for his international influence, and Khomeini has been described as the “virtual face of Shia Islam in Western popular culture”. In 1982, he survived one military coup attempt. Khomeini was known for his support of the hostage takers during the Iran hostage crisis, his fatwa calling for the murder of British Indian novelist Salman Rushdie, and for referring to the United States as the “Great Satan” and Soviet Union as the “Lesser Satan.” Khomeini has been criticized for these acts and for human rights violations of Iranians. He has also been lauded as a “charismatic leader of immense popularity”, a “champion of Islamic revival” by Shia scholars, who attempted to establish good relations between Sunnis and Shias, and a major innovator in political theory and religious-oriented populist political strategy. Khomeini held the title of Grand Ayatollah and is officially known as Imam Khomeini inside Iran and by his supporters internationally. He is generally referred to as Ayatollah Khomeini by others. In Iran, his gold-domed tomb in Tehr?n’s Behesht-e Zahr?? cemetery has become a shrine for his adherents, and he is legally considered “inviolable”, with Iranians regularly punished for insulting him. In March 1979, shortly after Ruhollah Khomeini’s return from exile and the overthrow of Iran’s monarchy, a national referendum was held throughout Iran with the question “Islamic Republic, yes or no?”. Although some groups objected to the wording and choice and boycotted the referendum, 98% of those voting voted “yes”. Following this landslide victory, the constitution of Iran of 1906 was declared invalid and a new constitution for an Islamic state was created and ratified by referendum during the first week of December in 1979. According to Francis Fukuyama, the 1979 constitution is a “hybrid” of “theocratic and democratic elements” with much of it based on the ideas Khomeini presented in his work Islamic Government: Governance of the Jurist. In the work, Khomeini argued that government must be run in accordance with traditional Islamic sharia, and for this to happen a leading Islamic jurist must provide political “guardianship” over the people. The leading jurist were known as Marja’. Article 107 in the constitution mentions Imam Khomeini by name and praises him as the most learned and talented leader for emulation. The responsibilities of the Supreme Leader are vaguely stated in the constitution, thus any ‘violation’ by the Supreme Leader would be dismissed almost immediately. As the rest of the clergy governed affairs on a daily basis, the Supreme Leader is capable of mandating a new decision as per the concept of Vilayat-e Faqih. This entry was posted in Uncategorized and tagged 1979, 3 December by Admin2. Bookmark the permalink.